After a few months with our long-term Honda ST1300 (see yesterday’s report), we have started to think about making some modifications to the bike. When our friends at K&N Filters offered up their direct replacement filter for the ST1300, as well as the opportunity to perform back to back dyno testing, we were happy to accept. As you can see in the picture above, K&N’s replacement filter for the ST1300 (part # HA-1302) appears to be quite a bit less restrictive than it’s OEM Honda counterpart. In fact, according to K&N Product Engineer Charlie Tissen, HA-1302 flows approximately 15% more than the factory Honda filter. We were curious to see if this increase in flow translated to increased wheel horsepower. 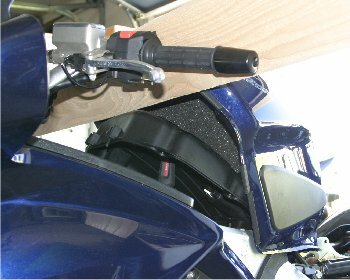 Installation is extremely simple, and anyone who has ever worked on a motorcycle before should be able to perform the install in around 30 minutes. To access the airbox, first remove the seat, then release the tank by removing the 10mm bolt located at the base of the tank and the two 8mm bolts located at the top near the steering head. The tank will remain attached to the bike by some lines and cables, but you can prop it up out of the way using something layed across the handlebars (if you’re smarter than I am, you might use the tank prop which can be found under the seat – thanks to the readers who let me know about this). 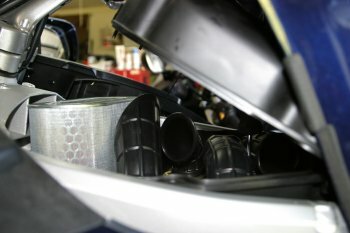 With the tank propped up and out of the way, the top of the airbox can be detached by removing the 9 phillips-head screws around its’ perimeter. Lift the cover off to expose the filter. The filter is just sitting in the airbox, so go ahead and pull it out and replace it with the K&N part. Then reverse the process to reinstall the airbox cover (which retains the filter) and the tank. Before installing the filter, Tissen made several dyno runs with the stock configuration to get a baseline for comparison. In stock form, our long-term ST1300 belted out 111.7hp at 7750 RPM on K&N’s Dynojet. After installing the K&N replacement filter, we were amazed to see peak power jump to 117.74hp at 7500 RPM, a solid 6hp gain. The ST1300 picked up power everywhere, gaining 2.5hp at 2500 RPM, 2.8hp at 4000 RPM, and 5.2hp at 5500 RPM. Click here to see a dyno chart comparing the before and after results. These power gains might sound too good to be true, but if you look at the incredibly restrictive design of the stock filter they start to make sense. 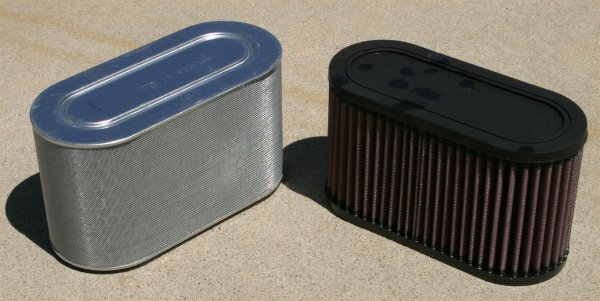 Besides the added horsepower, the K&N filter can be washed and re-oiled when it becomes dirty, as opposed to the stock filter which must be replaced. K&N Filter HA-1302 for the ST1300 retails for $72.95. The power gains are real, and they provide a great bang for not too many bucks. Rolling on the throttle in 5th on the freeway, the engine feels noticeably stronger. We also noticed a significant improvement in throttle response. To find out if K&N makes a filter for your bike, check out the .